This hotel is housed within a charming country villa and is located in Winterbach, a 20-minute drive from Stuttgart, also accessible through S-Bahn, a link for which can be found just a 10-minute walk away. 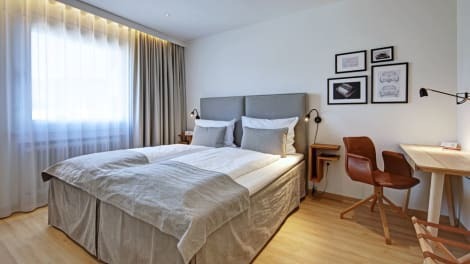 All of the cosy home-like guestrooms feature carpeted floors and modern amenities, including a private bathroom and WiFi connection. In-room entertainment is provided through TV with cable and free satellite sports channels and some of the rooms are adapted to the needs of disabled guests. International dishes are served at the hotel restaurant, while the elegant lobby bar offers a variety of drinks. Take advantage of recreation opportunities such as a health club, or other amenities including complimentary wireless Internet access and shopping on site.